In our November/December 2016 issue, we highlight cocktails incorporating winter citrus. 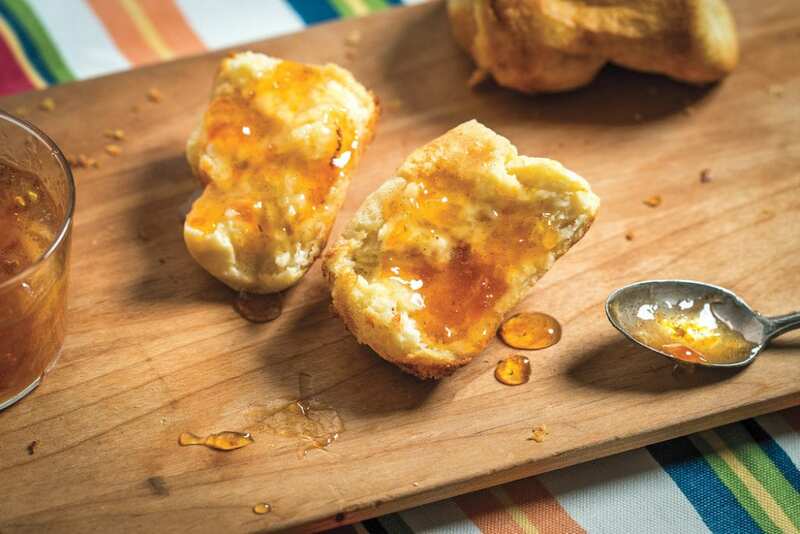 For leftover fruit, we love this boozy citrus marmalade from Brooklyn bar and bakery Butter & Scotch. In their new cookbook, founders Keavy Landreth and Allison Kave suggest using a variety of citrus, like kumquats, tangerines, Meyer lemons and pomelos. A good pour of brandy adds the perfect finishing touch. Cut the stem ends off the fruits, cut each fruit in half lengthwise, and remove the seeds. Using a vegetable slicer or mandoline, cut the halves into very thin half-moons. Wrap the grated apple in cheesecloth and tie it into a tight bundle. In a large pot, combine the citrus, sugar, lemon zest and juice, vanilla bean and seeds, and green apple sachet. Cover with 4 cups water and bring it to a boil over high heat. Lower the heat to maintain a strong simmer and cook, stirring frequently, about 40 minutes, or until the fruit is very soft. While the fruit is cooking, prepare and sterilize your jars and lids (to accommodate about 3 quarts of marmalade) by boiling for 10 minutes. Place a small plate in the freezer. Remove the apple sachet from the pot, increase the heat to restore to a full boil, and cook until it reaches 220°F (105°C) on a candy thermometer, about 30 minutes. Remove the marmalade from the heat. Put 1 teaspoon of it on the plate in the freezer for 2 minutes, then test it by pushing your finger against the edge of the jam. If it wrinkles up instead of letting your finger slide through, it’s ready. If not, return it to the heat and cook it until you get the results you want. After the mixture reaches the setting point, remove it from the heat and let it rest for 5 minutes. Stir in the brandy, then ladle the marmalade into hot, sterile jars and process them in a water bath, or allow them to come to room temperature, then refrigerate. The jam will keep for up to 1 month in the fridge. Reprinted with permission from Butter & Scotch by Keavy Landreth and Allison Kave. Copyright 2016, Abrams, New York.